The Gospel Press building in the Tremont area of Cleveland, Ohio is located at the intersection of West 7th Street and Jefferson, and borders Thurman on the west side. It is actually a complex made up of multiple buildings. The origins of the site date back to the Pre-Civil War era. 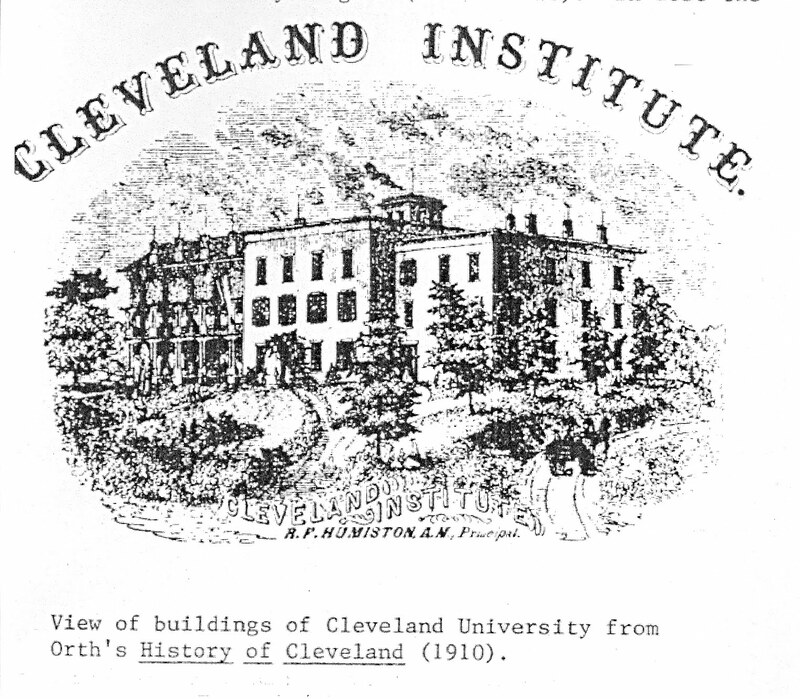 On June 3, 1850 The Herald, which was Cleveland's second newspaper founded in 1819, announced a "Splendid Project" and explained that a national university was going to be built in Cleveland that would be patterned after Brown University and called Cleveland University. 275 acres were purchased and Tremont at that time came to be known as University Heights because of this planned institution. In 1851 the first educational building and the President's home were built on the site. This is why the streets in this area were named College, Professor, University, and Literary. According to the Encyclopedia of Cleveland History, eight degrees were awarded in June of 1852, however in December the president resigned and within months Mrs. Thirza Pelton, the school's leading benefactor, died in February of 1853. The plans for the school quickly evaporated. Six years later in 1859, Ransom Humiston ran the school as a co-ed college preparatory school for eleven years. During the Civil War disabled soldiers were offered free education there. That school closed, and in 1870 the site then became the Homeopathic Hospital College. In 1874 the Homeopathic College bought property on Huron Road (that would eventually become Huron Road Hospital.) 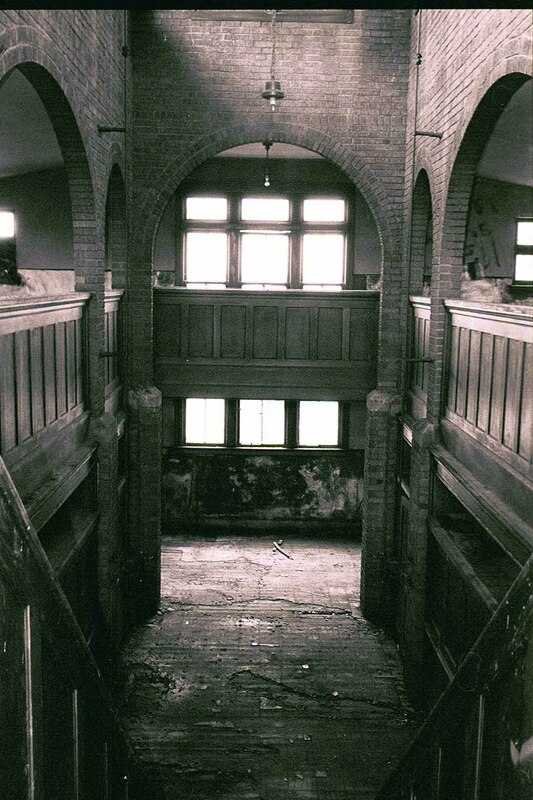 The Huron Road Hospital opened in 1880, and the property in Tremont was no longer needed. 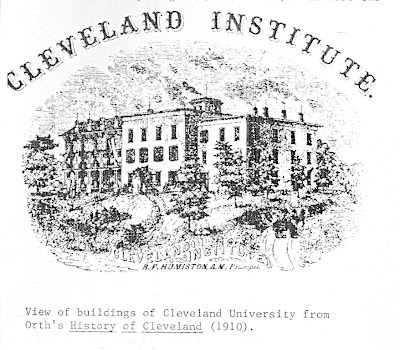 It's noted in The people are the city: Three Cleveland neighborhoods, 1796-1980 that the few buildings connected with the university were razed in 1917. 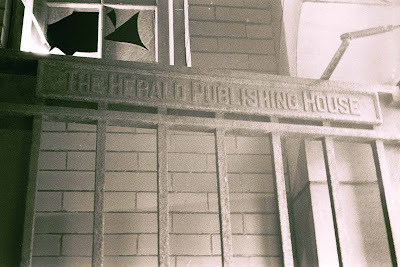 In 1907 the Herald Publishing House and the Gospel Worker Society moved from their headquarters in Pennsylvania to this site. They produced religious magazines and literature. The following map shows the property including the complex of buildings that made up the Herald Publishing House in 1922. Also in 1922, the missionaries changed the name of the group to the Union Gospel Press. 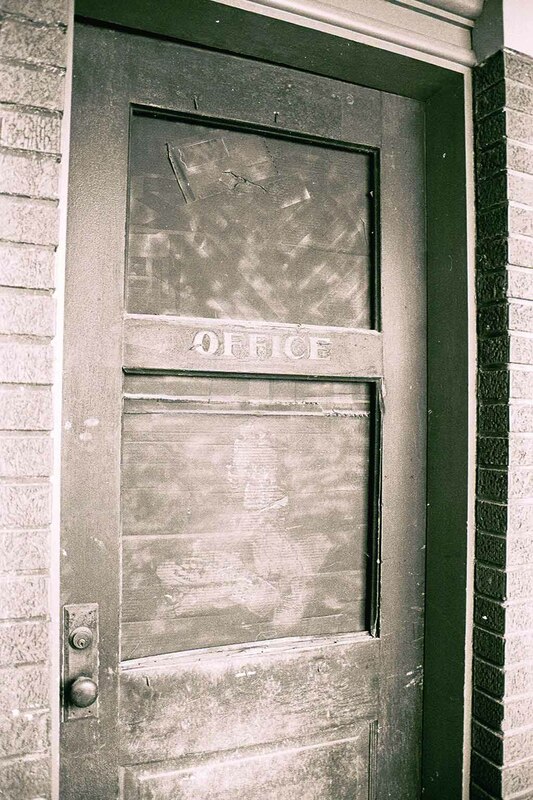 You can see that the Gospel Press buildings did not stretch to Thurman yet, as they do now. 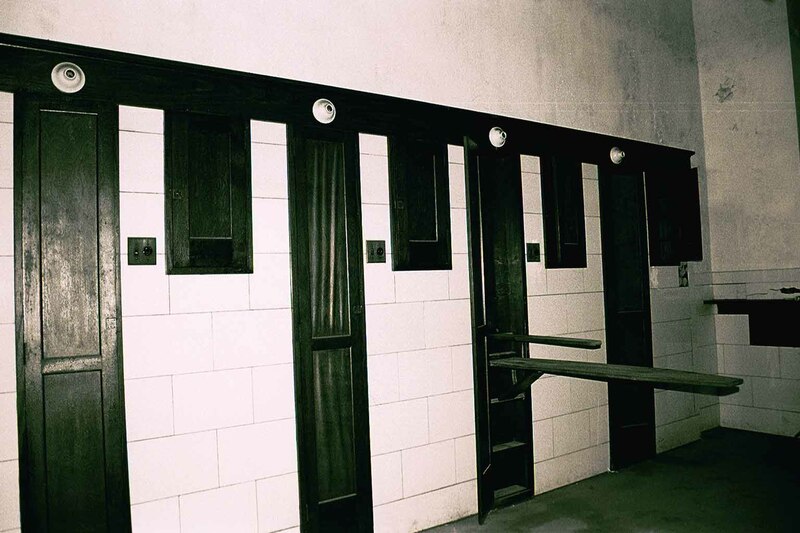 The group continued to renovate the complex to fit their needs. This is most likely how it came to be such a labyrinth. 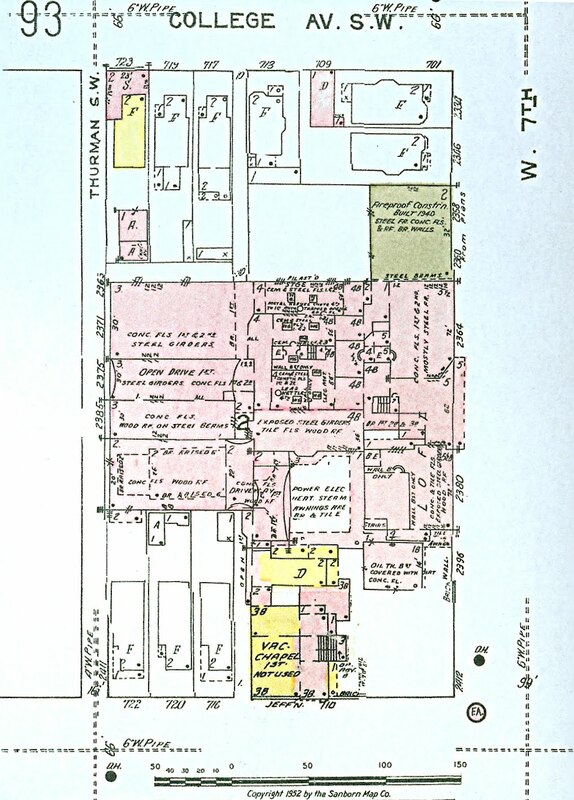 The following map is very detailed and even indicates a 1940 addition at the northern-most point of the complex. Eventually the Union Gospel Press decided to move their current site at Brookpark and Broadview in Cleveland. They constructed a one-story building and moved there in 1950. 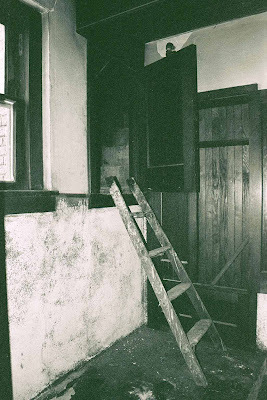 In the next 50 years the property in Tremont fell into several different sets of hands. In 1952 it was sold for $180,000 and it was noted that at that time it was being used for offices and light manufacturing. A later appraisal indicated that part of the buildings were being used as a rooming house/hotel. According to this article in the Free Times, the father of a local realtor named Tom Sammon, owned the building from the 1950s to the early 1970s. The article notes that three shifts of union pressmen printed books for the Cleveland Catholic Diocese in the buildings. In 1967 various uses were listed on an appraisal form including a thermo electrical company, a lithography school, a church, and a rooming house. It was noted that only 10,000 square feet was being rented at that time, and the rest was vacant. In 1987 the complex was purchased by a former boxer named Joe Scully. During the next couple of decades many artists and homeless persons squatted in the buildings. The following photos were taken pre-renovation in September 2006. This property, unlike so many others discussed on this blog, has a happy ending. It was purchased in 2003 and renovated into apartments and hotel suites. 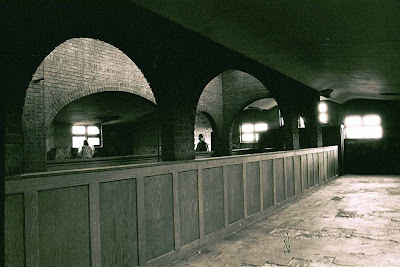 It was recently featured by the Cleveland Restoration Society on one of their SNOOP tours. If you are interested in living or staying at the Union Gospel Press property (now known as Tremont Place Lofts) visit their site. You can see all the photos I took of the Union Gospel Press building in September of 2006 here. Tremont Place Lofts just won a Preservation Award from CRS and AIA last night! Share congrats with me! Was fortunate enough to have toured this building back in 2006, pre-restoration, and earlier this year, after they were nearly 100% leased up. This is one of the most unique sets of buildings in all of Cleveland. In terms of size, "hidden treasures," and success/quality of restoration, I can only compare it to the ongoing work at Tyler Village. Great post Christopher! So far this is the only reference to "Cleveland University" that I can locate. Was the ill fated institution actually housed in any of this existing structure? It was also listed as a Civil War hospital 1862-1865, but the photos and description list the US General Hospital at Jefferson and 5th Streets (Hershal), which is the same location given for Camp Wade. Photos show Camp Cleveland with a Wood Framed General Hospital. Any input to clarify here? Thanks, this is the most informative site I have found so far! I worked on the restoration as a concrete cutter, and i had several strange incounters with things that i can not explain. I played in there aa a kid. 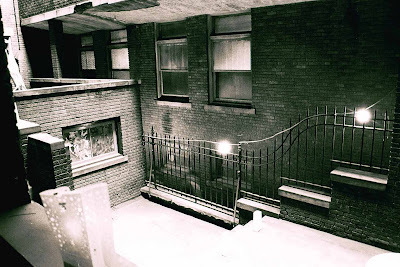 One day the caretaker told me I was standing on "Jimmy" a 6x3 spot of concrete outside one storage building. I visited the complex about a year ago and the area was still there. 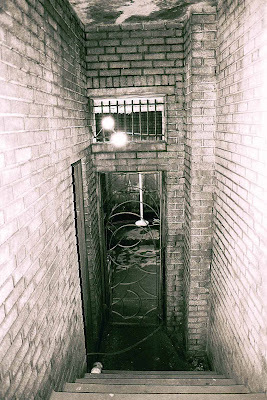 The Mafia used to hold meetings there because the place was a stronghold and had a tunnel exit to a church for any fast escape they could need. What church did the tunnel exit to?